The Luna Dining Table is defined by its clean lines and simplicity form, yet because of its perfectly proportioned stature, makes a bold statement when experienced in person. The Luna makes its presence known, but only so much so to be admired for its polite, humble demeanor. While upscale & reserved in nature, the Luna is highly approachable; while the quality often sought and expected from sophisticated modern design often comes at a premium, the Luna offers it with a smile, a handshake and unbeatable value. The Eco-Natura Luna Dining Table is constructed from an advanced German engineered wood, with a rich, glossy white applied lacquer. Its top sits on an exquisitely chromed steel base with a mirrored finish. Both eco-friendly and environmentally-safe, the Luna is CARB compliant and VOC-free. Beautiful modern white table! Has a very glossy finish... Everything I had hoped for in a table! I LOVE THIS DESIGN BUT i wish I would have gotten in the smaller size! A little too large for the space it's in! Table completed my kitchens SILVER & WHITE look!! FINALLY IT'S DONE AND I LOVE IT!! Beautiful combination with the reflective base and white lacquered top, it looks brilliant and stunning in my dining room - ultra modern, completely turned the place around! Pros: The table is absolutely beautiful! It arrived without a single scratch or dent! There were no screws missing, and there wasn't any awkward smell associated with the packaging! Customer service was always readily available to answer my questions. I am very very pleased an excited with my new dining table. Cons: I'd never heard of this site until I came across and ad, so I was skeptical of quality and shipping. The shipping took far longer than listed which I was not happy about at all. However, InMod did accommodate for that. Also, InMod uses third party shippers (FedEx) in my case. Third party anything is super annoying because it forces us (the customers) to have to deal with two companies! I had to stay on top of the tracking that I had to call several times to receive, and I had to schedule a time for my own delivery. InMod needs to improve their shipping practices and make them more favorable for the customer. That's my biggest complaint! Brilliant and gorgeous! Sled base legs with sled base chairs is a design YESS!! Thank you customer service!! sheen on the legs is stunning! Beautiful with my metallic accent pieces in the kitchen! Love the clean-lines and sleekness of this design. I paired with molded fiberglass chairs in black with steel base, my whole kitchen is a black and white color theme. It looks great, thank you! This table is amazing. I love love love the look but love even more than when I called to ask a few questions I was told its scratch and burn resistant. It was like the best of both worlds in a table. I love the high gloss white finish. It's so crisp and sharp looking in my dining room. Perfect size too. ProsBurn and scratch resistant is my favorite part. The table top has a high gloss lacquer finish. The base for the table is chromed steel which will be shiny. The distance between the legs for the large size is 55.75". The distance between the legs for the small size is 40". Are there chairs to match the table? Is the top a very bright white or more of a cream white? This table top would be considered a bright white. While this table has a protective finish to help prevent stains, any spills, especially pasta sauce, wine or coffee rings, etc., would need to be cleaned up promptly with a mild soap and damp cloth. We do recommend using trivets and coasters with this table. Can you put hot pots and pans on this table top? Trivets and coasters are recommended when using this table. How heavy is the table? Is the top heat and scratch resistant? What is the warranty? The small size table weighs 102 lbs and the large size weighs 145 lbs. The top is made with an engineered wood with a lacquered top which is somewhat scratch resistant. 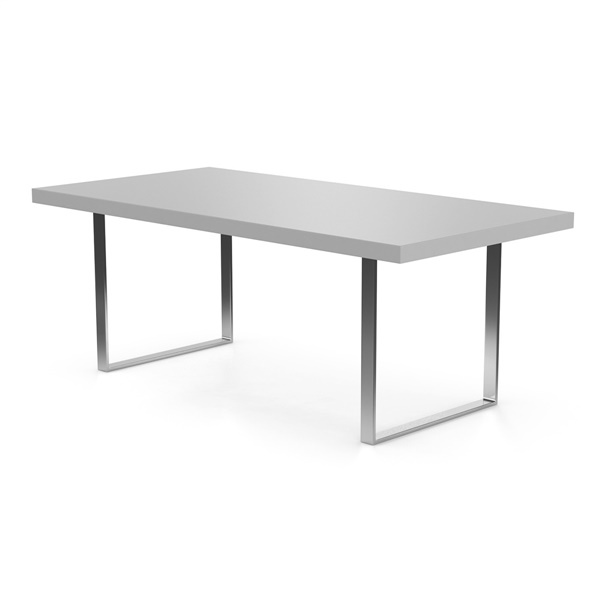 This table comes with a 1 year warranty to be free from manufacturers defects. How many can sit at this table? The Eco-Natura Luna Dining Table can comfortably seat 6-8 guests at its spacious & luxuriously finished tabletop.